What’s the First Butterfly of Spring? When the days grow mild and the snow melts, I start to watch for Mourning Cloaks. This one appeared to have claimed our patio as his territory today, flying away every time we walked past but returning a few moments later (this is typical male butterfly behavior). These elegant-looking butterflies are always among the first to emerge, and with good reason. See how the trailing edges of his wings are looking a bit tattered? Well, you’d look a bit tattered too if you’d spent the Wisconsin winter out in the woods, hiding under a rock and pumping natural antifreeze through your body to keep ice crystals from forming inside your cells. Yes, Mourning Cloaks actually hibernate through the winter as adults, sheltering among the rocks and debris of the forest floor. This means that they can emerge to fly on the very first warm day of the year, while other butterflies are still working on metamorphosis. It also means that they have one of the longest adult lifespans of any North American butterfly – 10 to 11 months. Their name comes from a supposed resemblance to traditional mourning clothes (I tried to find more information about this, with no luck). The underside of their wings is less flashy, letting them instantly switch from colorful display to dead leaf disguise. 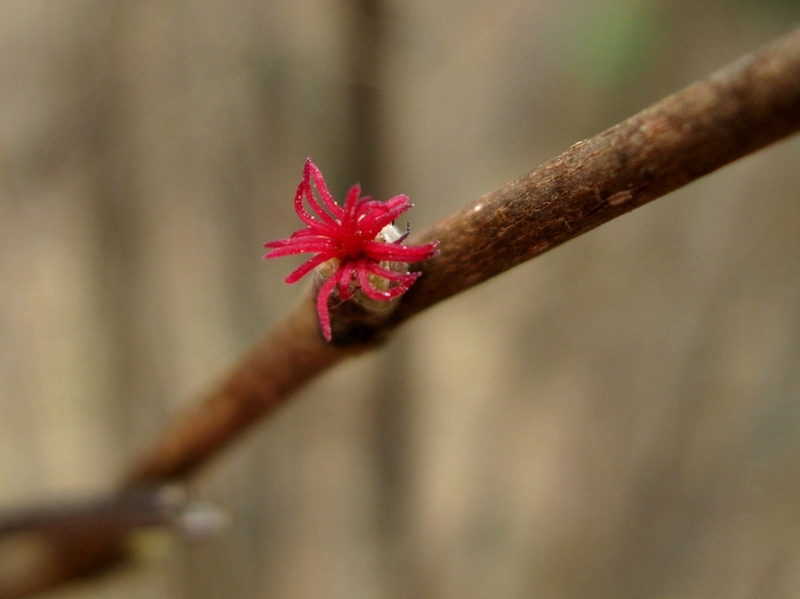 By the way, if you’re wondering what these early-flying butterflies eat when there are no flowers to speak of yet, the answer is simple – just like us maple sugaring humans, they know that this is the time of year when the sweet sap is running in the trees and weeping down their trunks. Delicious! 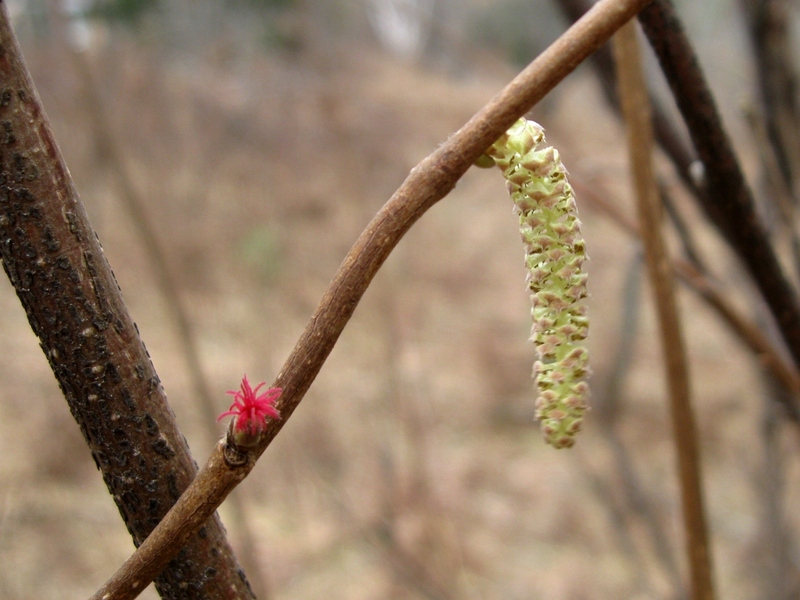 One moment of nature blog serendipity before I go – on Monday Elizabeth of Woods Walks and Wildlife posted photos of male and female hazelnut flowers where she lives in Connecticut. Well, today I stumbled upon a blossoming hazelnut of my own here in Wisconsin and instantly recognized it thanks to her. Wow! This was my first butterfly of Spring too! I’ve awarded you – sound of trumpets – a Liebster Award! See my blog for the details. 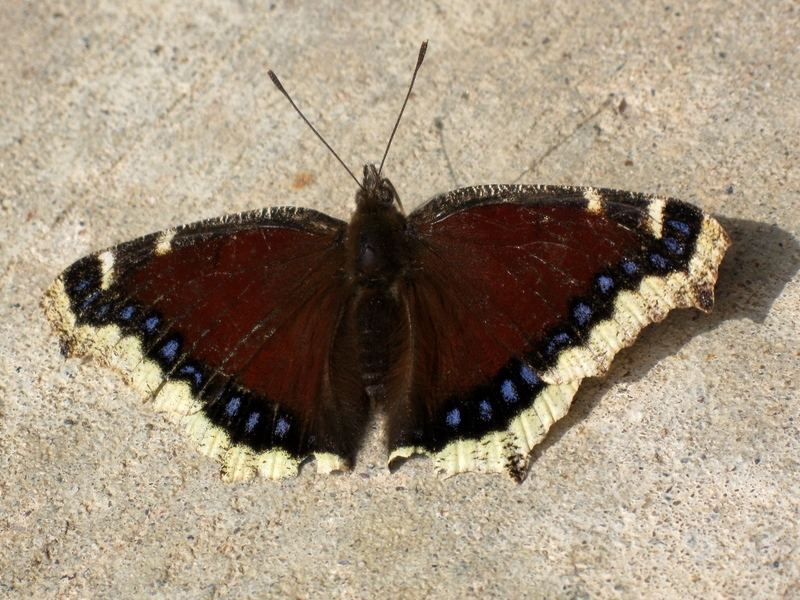 The Mourning Cloak was the first butterfly I saw this year in the Missouri Ozarks, on February 23. One of these flitted by me in NE Iowa this past Sunday. Couldn’t catch up to it to get a pic! Hej Rebecca, It’s such a beautiful butterfly. The Nymphalis antiopa might have something to do with Greek mythology. The Greek princess Antiope, who gave birth to twin sons, while she was in prison, They were taken away from her, but she was united with them years later. It’s a long story! The Nymphalis antiopa is rare in DK, but in some years it arrives in numbers from Russia etc. I hope I’ll see it this year. . 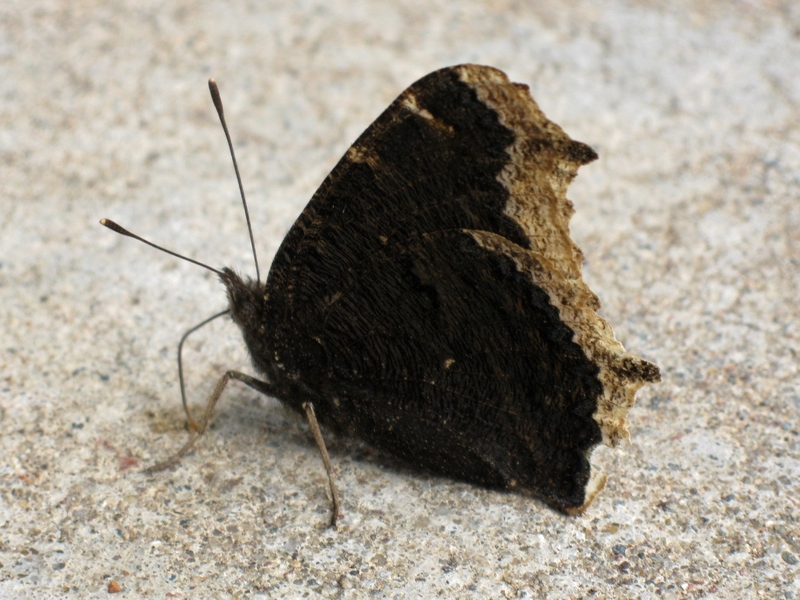 I saw my first Mourning Cloak of the season on Monday here in Southeastern Massachusetts.